The directions on this page are taken directly from the websites of the individual locations. Directions written by the club will be included in the premiums. 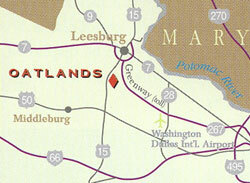 Oatlands is located six miles south of Leesburg on Route 15, approximately 45 miles from Washington, DC. From DC/Arlington: I-66 West to Exit 67 (Dulles Airport) to 267 West (toll road) to Leesburg. Exit 1A then second right (15 South Warrenton). Oatlands front gates are five miles on the left. From Fairfax: Route 50 to Route 15 North at Gilbert's Corner. Turn right (north). Oatlands front gates are six miles on the right. to 15 South Warrenton. Oatlands front gates are five miles on the left. From Warrenton: Route 29 North/East to Route 15 North. Route 15 will cross Route 50 at Gilbert's Corner. Oatlands front gates are 6 miles from Gilbert's Corner. NOTE - All of the above motels have accepted dogs in the past but please check policy when making reservations. Camping is permitted on the field, but no hookups are available. Bring your own water, power and clean-up materials. From Warrenton/South: Take Rte. 17 north for 8 miles. Great Meadow on right. To enter main gate, turn right on Rte. 245.
on Old Tavern Rd. (Rt. 245), Great Meadow one mile on left. Left on Old Tavern Road (Rt. 245), Great Meadow one mile on left. From South/West: Take I-66 east to Exit #28 for Marshall. Take Rte. 17 south for 3 miles, turn left on Rte. 245. 540-349-8900, Pet fee and need to be in smoking room. NOTE:  Check with  hotel to make sure they still take dogs.